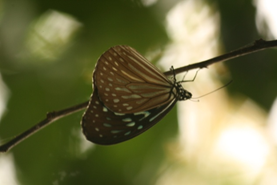 After my time at ZSL London Zoo working in Butterfly Paradise I developed quite an affinity for butterflies and moths, and one of my first impressions as I walked around the sacred Don Chao Poo forest was of the vast number of butterflies and varying species that were present. As an avid biological photographer, I had come prepared for such an eventuality. From this moment onwards I tasked myself with trying to get photographs of as many butterfly species in the forest as was possible during my time there, in order to be able to identify them and create a visual identification display for the new research centre. Throughout the three months that I spent carrying out research in the forest, whenever I got some spare time, I would head into the forest with my camera looking for some unsuspecting butterflies to photograph. I had photographed butterflies in the past and I was well aware of how skittish they can be when you are trying to get a photo of them, and numerous times I had walked away with either an empty shot, or a very colourful blur. So with this in mind every time I headed into the forest with the phrase ‘patience is a virtue’ ringing in my mind. So tip-toeing amongst the leaves looking for my first targets, I re-discovered just how sensitive these little creatures really are. As soon as I approached them, hundreds of butterflies would burst into the air, quite spectacularly, and disappear. 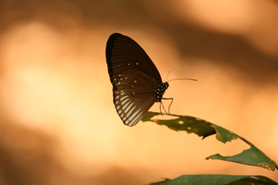 On my first few visits to the forest on my butterfly hunting trips I was successful with a couple of species – quite repeatedly. These were the species that turned out to occur most frequently within the forest and seemed least sensitive to disturbance. I started seeing more and more species, and noting down when and where I had seen them and what they were doing (sitting/flying around particular plants/speeding past), to enhance my chances of getting a useful shot of them. After a few more visits, frequenting the places that I had noted down hives of butterfly activity I started getting a lot more success, even if I did have to sit in silence for a good few hours to get the photos. For the few species that I had not so far managed to get any pictures of, other than a very attractive, however indiscernible blur on my screen, I tried to think of a few tricks to attach them, such as putting sugar water or fruit juice on the floor. Although this was very successful in attracting vast quantities of ants, no butterflies were enticed by my trickery. My sessions of sitting and waiting also proved productive for photographing an elusive bird species (White Rumped Shama) and a Monitor Lizard. 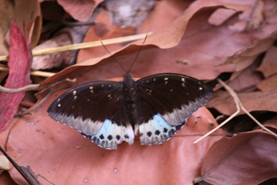 So how did my little side project pan out over the course of my three months attempting to establish a photographical biodiversity study of butterfly species present in the forest? All-in-all I am very satisfied with the photographs that I managed to get. There are some species that remained elusive to me, that I did not manage to identify, such as the large black and yellow butterfly that only seemed to fly amongst the upper canopy. However, this does provide something for future researchers to try and achieve. I hope that the butterfly display at the new research centre will encourage people to learn about the biodiversity present in their village. So what was learnt from this photographical butterfly hunt? – Always have your camera ready, keep your eyes peeled, and yes, patience is indeed a virtue. 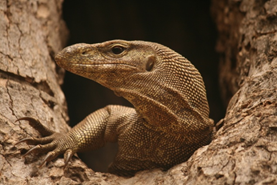 This entry was posted in Bio-diversity, Butterflies, Monitor lizards, monkey forest, Research, wildlife photography and tagged Don Chao Poo Forest Phana, Isaan, Isan, monitor lizards, Thai butterflies. Bookmark the permalink.